The Spyderco Junction is a compact outdoor utility tool built for performance, designed by knife maker Gayle Bradley. Ideal for hunters, backpackers or anybody on the go this all purpose cutting tool is up to the task. The Blade: The full tang Carpenter Steel PSF-27 tool steel alloy uses the Spray Forming Process resulting in improved wear resistance, toughness, crack resistance and higher hardness. The fine grain structure of the steel and the full flat grind gives effortless cutting from the graceful curved belly. The Handle: Wide ergonomic handle has an integral finger guard and is highlighted by two large hollow pins that secure the smooth G10 handle scales. While the handle is surprisingly thin it is also very comfortable to hold. The Sheath: Custom molded Boltran comes with the versatile G-Clip for a wide range of carry options. 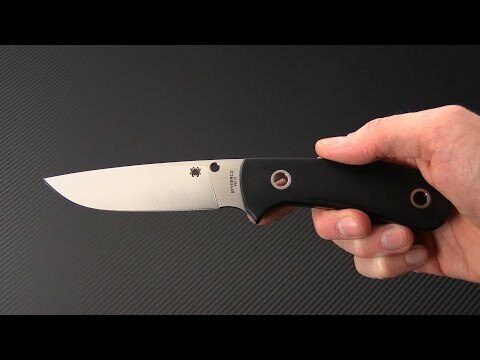 Brand new directly from Spyderco Knives.